Paradice Ice Skating, Botany, played host to the 2018 New Zealand Nationals Ice Figure Skating Championships over four days from Saturday October 6 to Tuesday October 9. 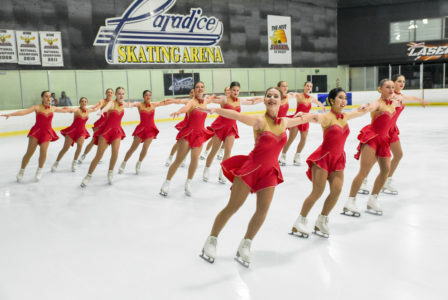 There were 179 skaters from New Zealand and overseas, including 12 Australian individual skaters and a senior synchronised skating team from Queensland. Black Ice From East Auckland. The skaters ranged in age from 8 years to adults and events included solo skaters, pairs, dance and synchronised teams. Maureen Forrester won Adult Interpretive Bronze III Ladies. This is the premier event in New Zealand and countless hours of often unsociable, early mornings at rinks around the country saw finest talent on display this past week on the ice. Maureen Forrester (Cockle Bay) won Adult Interpretive Bronze III Ladies; Tracy Danbrook (Pakuranga) won Adult Elite I Ladies; Black Ice (East Auckland) won the Mixed Aged Synchronized; Titanium (East Auckland) won Basic Novice Synchronized.